Quite literally Melbourne’s cup is overflowing with c-words. From the start of the Spring Racing Carnival to the running of the 150th Melbourne Cup to the celebrities, corporates, champagne and canapes taking over the birdcage, there are c-words from Coburg to Cheltenham. So here’s a look back at a week of c-words! 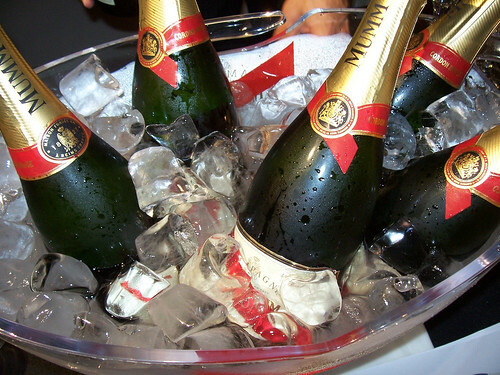 Firstly, the champagne’s flowing and Mumm’s the word or G.H. Mumm to be precise. The label, famous for its red ribbon, became the drink of choice at Flemington in 2010 after countless bottles of Moët et Chandon were consumed in years gone by. If there’s no show without punch, then there’s no horse racing without champagne. It’s the quintessential element of a day at the races … in fact it’s the quintessential element of any celebration. Mmmm Mumm!! Then there’s Cummings. While Bart’s horse may not have delivered the result many punters were counting on, Cummings remains a true racing identity and we hope he’ll be around for many Cups to come. Along with other racing identities, Bart Cummings featured in a wonderful portrait exhibition at Crown, Photo Finish. If you haven’t checked it out yet, head along before it finishes on 7 November. And speaking of photos, I’ve loved the images of Melbourne Cup through the ages! Now what would the cup week be without canapés? We’d all be blithering idiot because the champagne would have gone straight to our heads!! But whether you’re nibbling on tapas in the Spanish-themed Emirates marquee or partaking in some cheese and biscuits at a friend’s house, the snacks between sips are a critical ingredient of any celebration. And speaking of canapés and celebrations, there were plenty of chefs at the races with judges and contestants from Masterchef ready to sample and critique the various themed-foods as well as world famous chef’s in the kitchen. That brings us to celebrities. Melbourne’s Spring Racing Carnival would be rather dull without the birdcage full of celebrities. Whether you’re a casually dressed singer jetting in for a relaxing afternoon or the daughter of Ozzy Osbourne, there’s a perch waiting for you on the first Tuesday of every November. Then there are perennial favourites like KAK (Kerri-Anne if you don’t know! ), soap stars and football stars! And finally, there’s Her Excellency, The Governor-General, Quentin Bryce – a wonderful public speaker and always so well turned out. And finally, where would we be without the coverage. Channel Seven kept the television viewers happy once again (although perhaps next year they could turn one of their three channels over to a show dedicated to what’s happening around the track?? Food for thought!) While Bruce and Joanna led the television coverage, scores of print journalists braved the wet to bring us all the colour and movement. And finally hats off to the wonderful work of the PR teams at VRC and the myriad of sponsors and supporters. If I had to choose a favourite piece of coverage it would be The Australian’s review of the marquees! OK, on that note, I’m fresh out of c-words. Time for a coffee and some work! PS. Congratulations to Americain on taking home the 2010 Melbourne Cup … I knew there was a c-word I’d forgotten!